When we moved to South Carolina, we sold our two desks and scrapped the office. 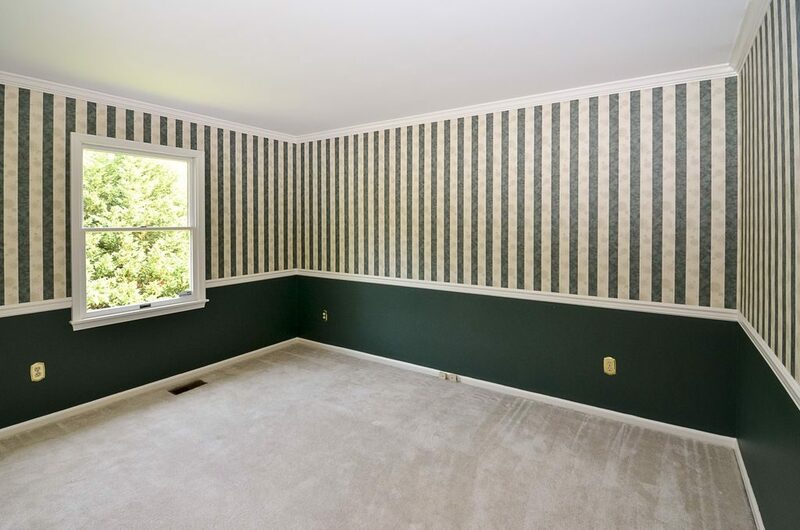 First of all, we didn’t have the space for it, as we lost a bedroom when we downsized, and secondly, we didn’t see the need for it as we had never used the office in our Maryland house very much. Oddly enough, my job down there didn’t really allow me to leave work at work much, but when I did bring it home, it was in the form of my work phone, which was probably the worst experience of my career so far (the phone, that is). 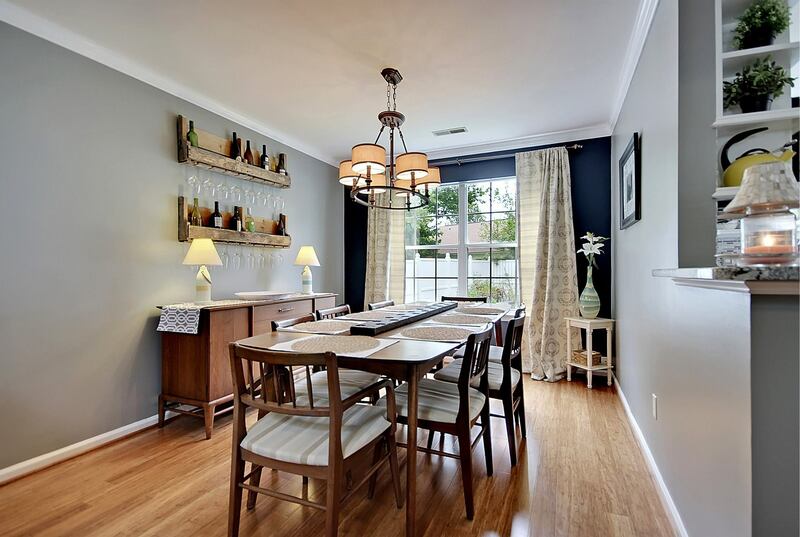 The previous owners of our SC house used the dining room as an office. I think it worked out loads better as a dining room. So, now we’re back in Delaware. We have the space for an office again, and definitely the need. 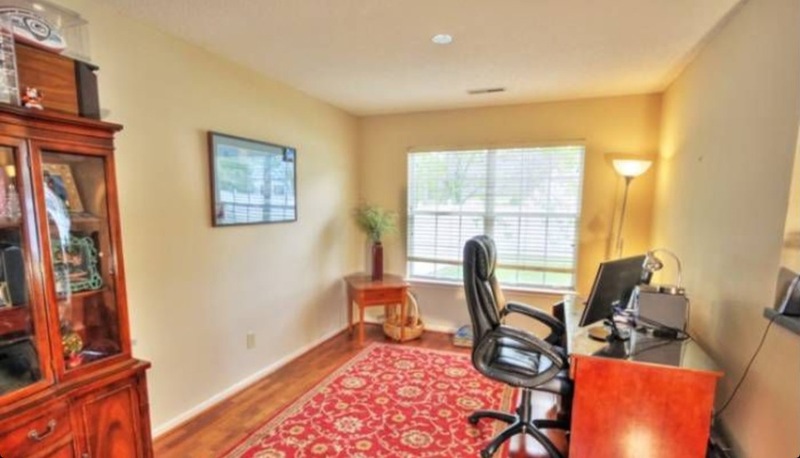 David works from home now, and needed a space that he could call his office. Our first inclination was to put it in the first floor room that we’re currently using as a guest bedroom. That wallpaper just screamed “I’m an office!” huh? Yuck. It’ll be torn down… at some point. It was a good size, but it only had 1 window. If David was going to spend 8-9 hours a day in there, he better be getting some good natural sunlight. It does good things for the soul. 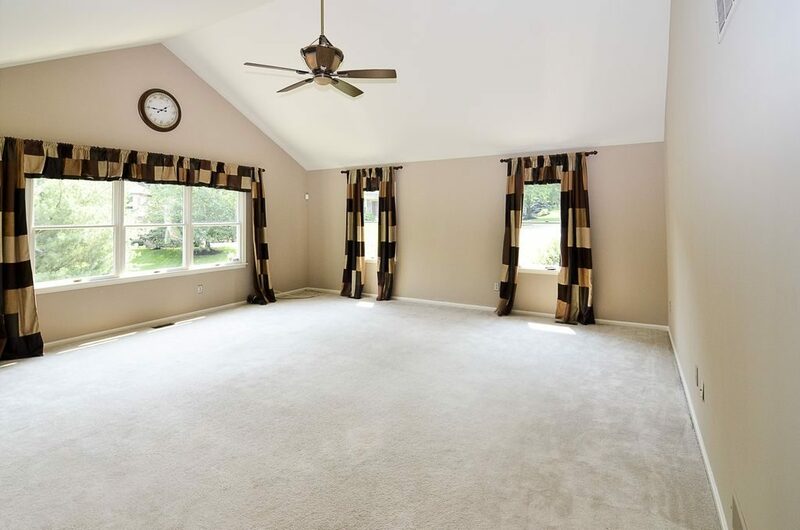 So the other option was the “great room”. It’s a room over our garage that didn’t really have much of an identity. Unfortunately, when we were touring this house, we didn’t really get to see how the previous owners used the rooms because they were all moved out at this point. Nosy me was sad about that! Check out those leather curtains! We didn’t really know what we were going to use it for. We thought maybe a “playroom” but it was so darn big for just that purpose. The more I looked at those three big, gorgeous windows and the streaming daylight, I figured it should also house David’s office. The natural light was perfect. So we decided that it would be half play room and half office going forward. I know most of you are probably like, “why in the heck would they put the office in the same room as the playroom?? ?” Talk about a productivity killer. Well, in our current situation, Connor is either in daycare, with me, or David’s mom during the week, so he’s not listening to Connor play in there all day while he works (most of the time). So on those days that Connor is sick, or our daycare provider decides to take a vacation to go to a wedding in India (that’s this week, actually!) it has been an absolute savior to be able to do our work at the desk (so we can still get our paychecks) while Connor plays along “happily” right next to us. Between the two of us working from home, we both manage to get a full day of work in while tending to Connor. (PS – this post was written on my day off, not while I’m working from home. 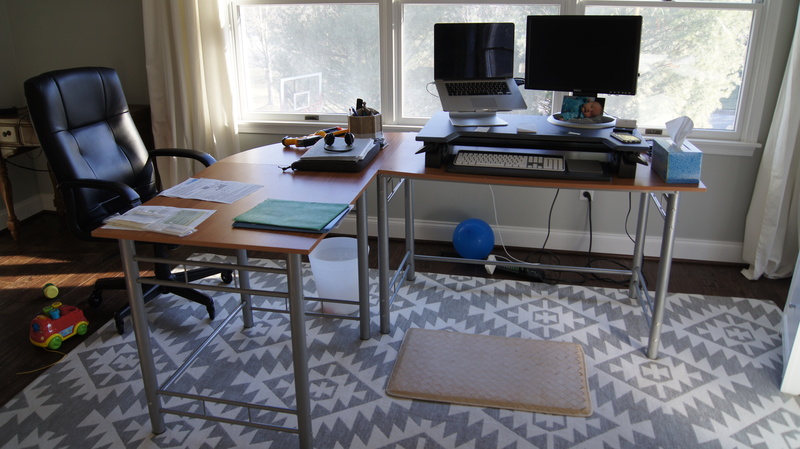 In case you were wondering…) The playroom/office combination is working great… for now. Who knows what it’ll be like when he gets older and crazier. 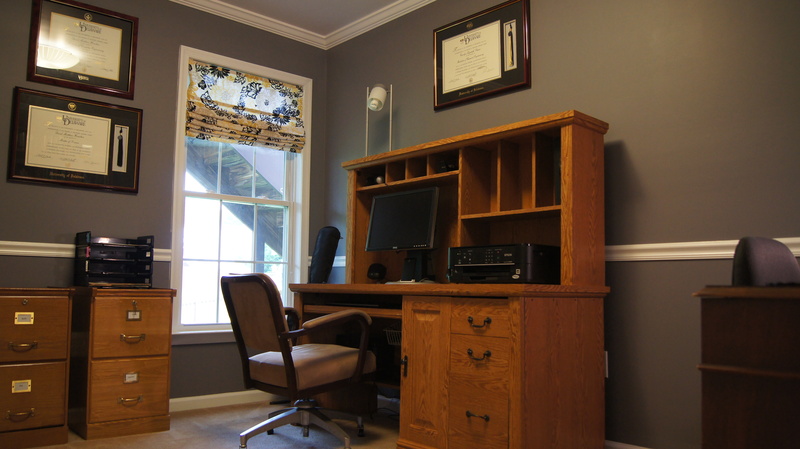 When we moved into this house, we came from our office-less home in South Carolina, and needed a desk for David. 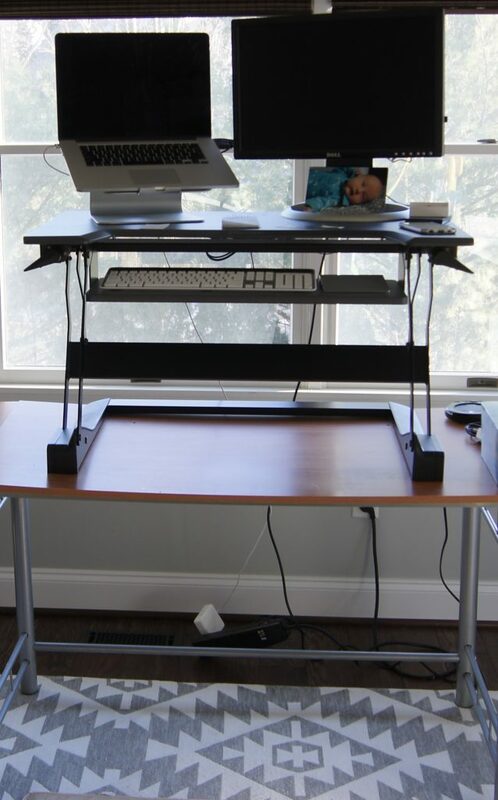 Luckily, David’s mom had just recently retired from her work-from-home job, and was looking to get rid of her desk! Woohoo. Nothing like free furniture after just buying a big house. This desk has served us well for over a year now. It’s not the most beautiful piece of furniture, but it was definitely functional. 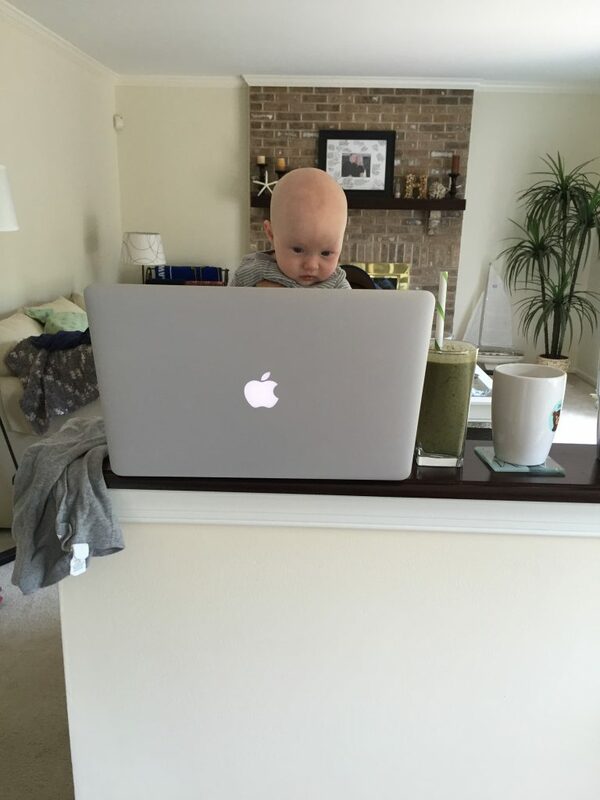 Months back, David decided he wanted to get a standing desk, since you know, sitting all day is the new smoking. While I knew I would want to upgrade our desk situation down the line, I figured he should get one of those tabletop units that he could switch over to a new desk when the time came. After a lot of research, he chose this one off of Amazon, and has been really happy with it. He got it on super-sale, but now that he has used it for a while he says it’s definitely worth the full price. I had been kind of half halfheartedly keeping an eye out for some desks for us. I really liked the idea of having two desks that faced each other so that we could both get a good view from the window, but also get a good view of the playroom. 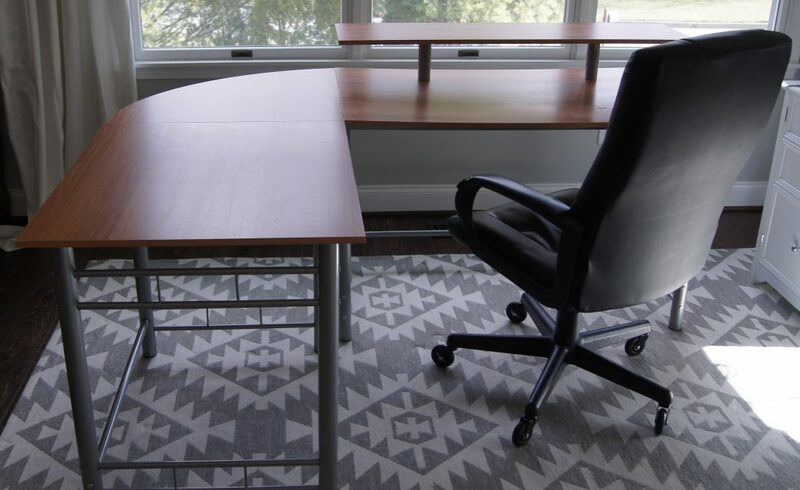 I didn’t think I’d have much luck on craigslist to find 2 quality identical desks that fit our needs. 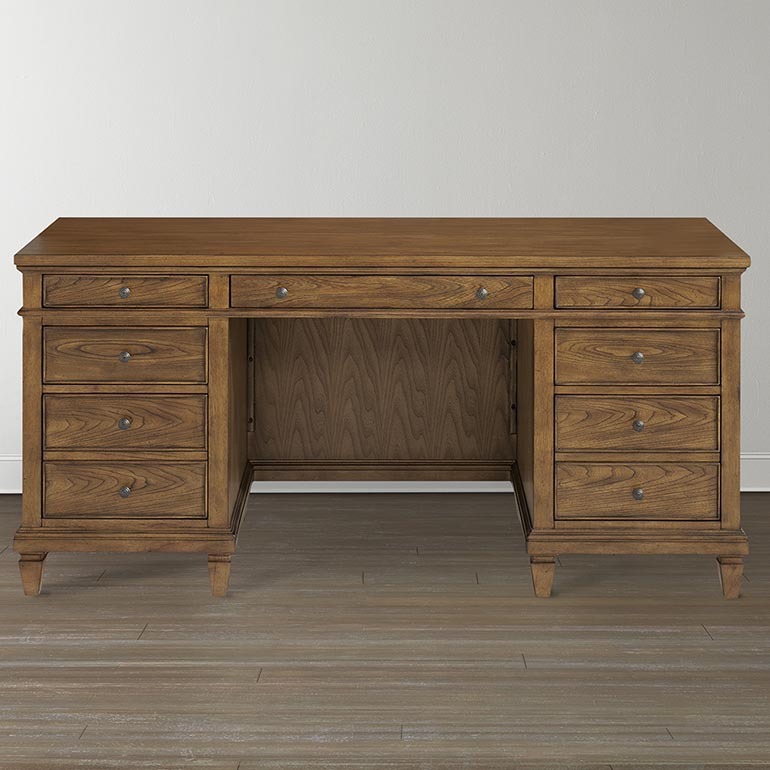 I also wanted some simple desks with the ability for storage for some files and basic things like pens, pencils, and a stapler. Our current Ikea hand-me-down has zero drawers, and I didn’t really want an additional piece of furniture besides the desks to clutter up the room. There are and will be a million toys in here. I also wanted something that would hide a lot of the computer wires from a curious infant-now-turned-toddler who loves to explore. 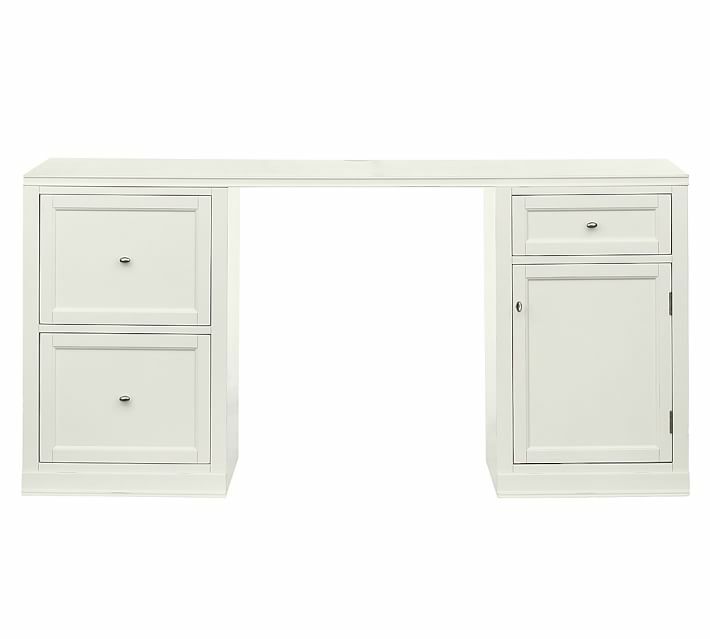 The only style that really fit the above requirements was an executive style desk. 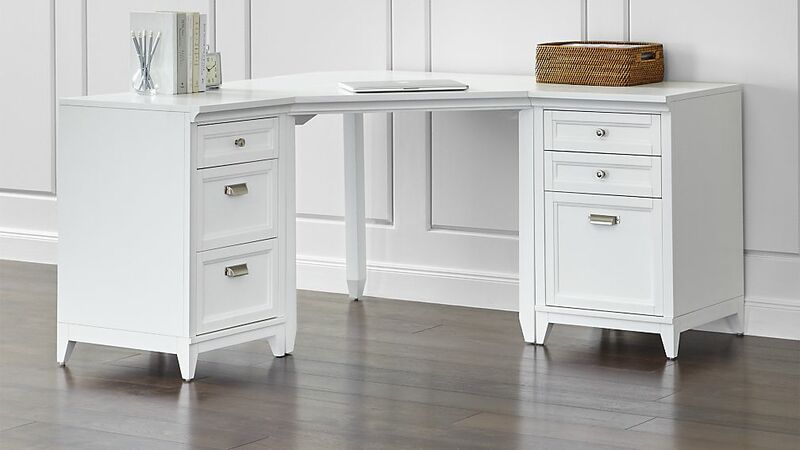 Man, some of those executive desks from my favorite stores are not cheap! And we needed two of them! Yea, no thanks. Not with this bill coming soon for the wall removal in the living room and HVAC replacement. 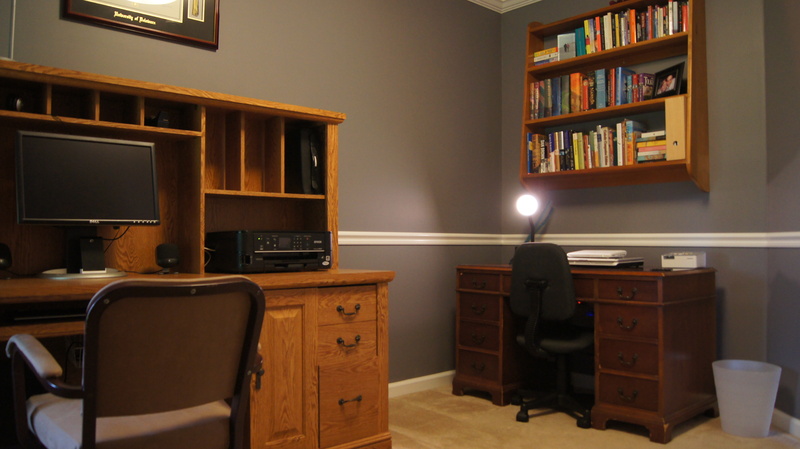 While I liked the idea of two corners desks like that Crate and Barrel example, I didn’t like the fact that two of them would probably take up a lot more space than we would have preferred.